*To calculate shipping, where do you live? 1. Editorial – “Pumpkin Spice and Everything Nice…” The editor shares a wonderful story of celebrating Fall. 2. "Remembering…” Entertainers share memories in regards to legendary Aretha Franklin. 3. 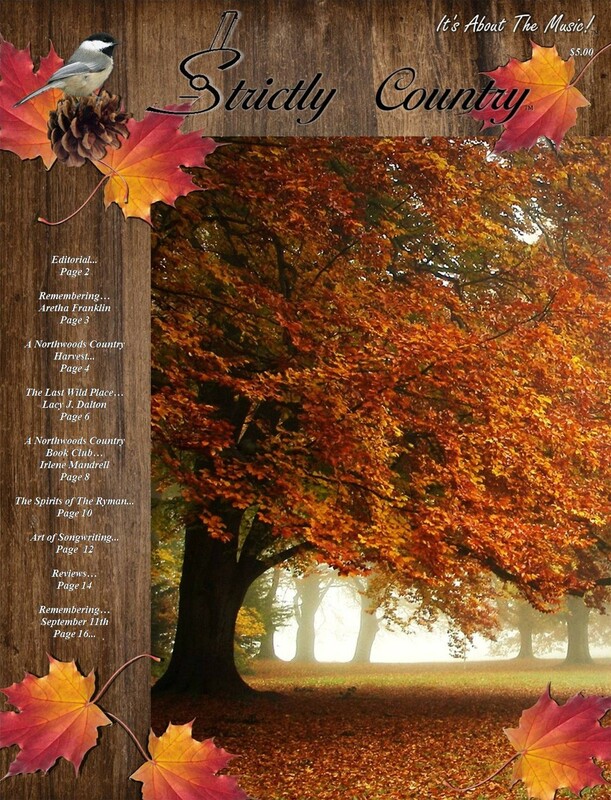 “A Northwoods Country Harvest…” Strictly Country shares with you the best songs to help you celebrate Autumn and the Harvest. 5. MAIN FEATURE - "God Rains Miracles…” Country Music entertainer Irlene Mandrell shares behind the scenes stories of her new book “God Rains Miracles.” 6. “Spirits of The Ryman…” Strictly Country shares with you several stories and songs that speak about the ghosts that reside inside the Ryman Auditorium. 7. "Art of Songwriting…” In this extended and final article, we speak about using to many words within the lyrics. 8. “Reviews…” Strictly Country reviews new albums by Dale Ann Bradley, Circa Blue, Dennis K. Duff, Rebekah Long, Lee Roy Parnell, Pearl, Kim Richey. 11. “Remembering…” Strictly Country shares a wonderful story and songs that help us remember the events of September 11, 2001.